For guests visiting Walt Disney World or Disneyland with a special diet, the popular Dole Whip treat is now just about the perfect snack! Dole Whip’s fruit flavors are now vegan! And Dole Whip has always been gluten free. Dole Whip fruit flavors are now vegan! 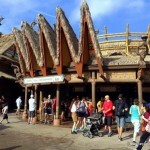 At least, they are according to the official Dole Whip Mix website — Unified Enterprises Corporation. 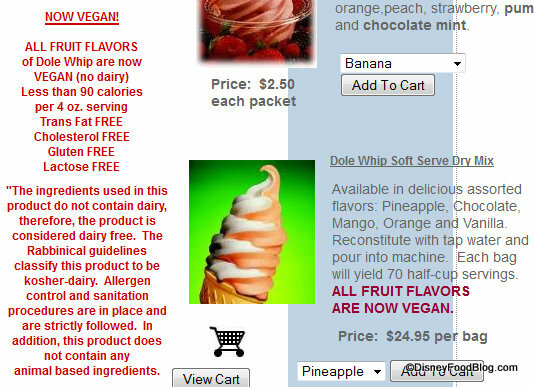 You can now enjoy any fruit flavor of Dole Whip on your vegan and/or gluten free diet! 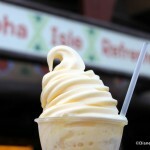 In Orlando, look for Dole Whips in the Magic Kingdom at Aloha Isle and at Pineapple Lanai in the Polynesian Village Resort. 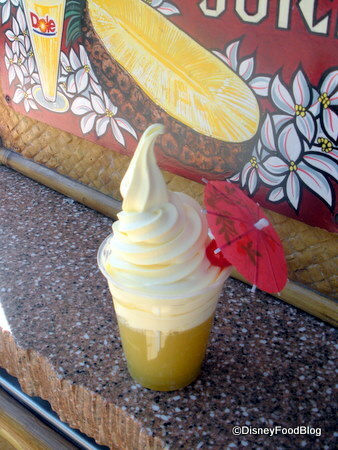 If you’re on the west coast, Disneyland serves up Dole Whips at the Tiki Juice Bar! Source: Unified Enterprises. Note that because Unified Enterprises sells its mix to Disney, it can be assumed that Disney’s Dole Whip fits these criteria as well. As always, check with Disney chefs and managers during your vacation to make sure all items are safe for your consumption based on your particular diet. 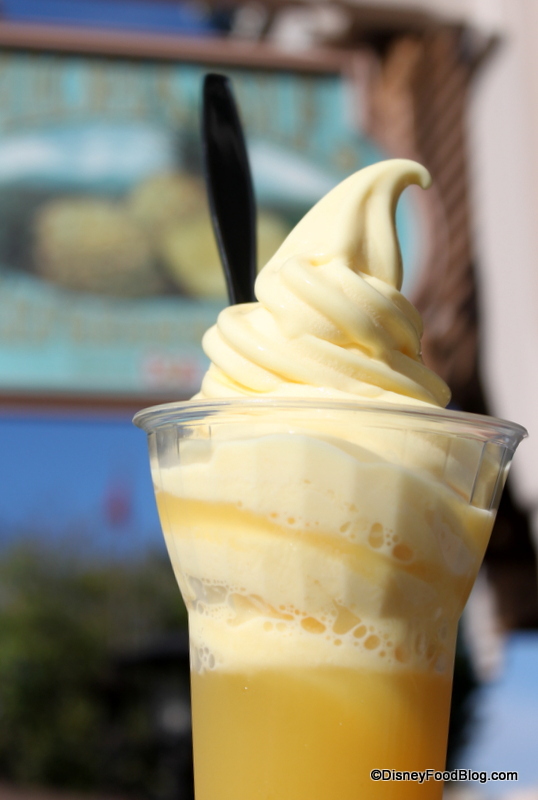 What is your favorite flavor of Dole Whip? Do you make your order a float? Let us know in the comments below! Our favourite gluten free snacks at WDW! Anybody tried the mix in a home ice cream machine? This made my day! Finally, as a vegan I can have my favorite treat again. So what IS in a Dole Whip? Heather: I think that’s probably best left unsaid. It’s probably one of those things where if you knew, you’d no longer be able to enjoy your favorite treat. Tracy — I was recently at a party where the host got the mix to use. The Dole Whip turned out great! Hauntedmansion138 — Fantastic! Have a great next Disney trip! I’m actually surprised Disney doesn’t have an exclusivity contract for this. What’s stopping Universal from buying these and selling them? Orange Leaf provides an ingredient list for their offerings, and they also serve Dole Pineapple and Orange soft serve. If not exactly the same, the ingredients are probably similar, so for those who really want to know, scroll to the very bottom! Am I the only one wondering how you make soft serve ice cream with no dairy? Rhonda — Dole Whip is not classified as ice cream. It is called a “non dairy frozen treat”. So were they not vegan before? Or are they just labeling the mix as “vegan” now that they figured out that it is? As a lactose intolerant person, I appreciate anything lactose free. There is so much cheesy dairy stuff in the world, dairy eaters please don’t complain. For us intolerants, sometimes a once in a while treat is great. We call it better living through chemistry. This is great news for vegans and those with dairy allergies. At one point, Dole Whip contained Sodium Caseinate. Thanks for spreading the good news! 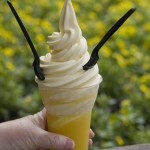 I think we had a Dole Whip almost every day we were at Disney World! 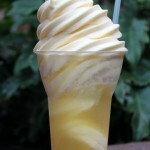 My fave – the Pineapple Dole Whip with the pineapple juice!! No big deal to have once a year. Oh well….I was looking forward to having a citrus swirl on our next visit, but I guess I’ll need to find an alternative now. What about the pineapple/vanilla swirl? I know the pineapple is lactose free but does the vanilla part have dairy in it? 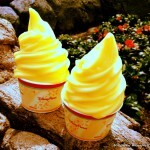 Dole Whip is unfortunately not Vegan at Disney World, due to cross contamination. They use the same buckets to mix all I their flavors, which means that there are traces of casein in the fruit flavors still. Since Disneyland only sells Pineapple, this is not an issue there and it is Vegan as a result. I consider this a wedding gift to me. I am getting married Friday the 13th of September in th park and can’t wait to celebrate as a “toast” with this…seriously. Because I have a dairy allergy, I wrote to WDW Special Diets and asked them about Pineapple and Orange Dole Whip served at MK. I explained that the manufacturer says those flavors of Dole Whip are now dairy-free, and asked if the ones at MK are. I was told that the MK Pineapple and Orange Dole Whip contains caesin. And reminded to always check ingredients at the actual restaurant. I don’t know if they were using old ingredient info, old stock, or if there is a contamination issue as others above have noted, but that is what I was told. Needless to say, I was very disappointed, because I was looking forward to eating Dole Whip on an upcoming trip. For a couple of times a year treat? This is awesome news! Great news! so does anyone know is this the same mix on board the cruises? I have read the ingredients for dole whip fruit flavors online, and they include “Sodium Casienate (a milk derivative)”. This would indicate that Dole Whip is NOT VEGAN after all. Have the ingredients changed? The statement above says “no animal based ingredients”. I’m confused. Ann — The sodium casienate is in the chocolate and vanilla flavors. DOLE® Soft Serve mix is manufactured exclusively by Kent Precision Foods Group, Inc. in St. Louis, MO.